In Spanish, Capirotada is officially known as "Capirotada de vigilia". And the origen of Capirotada, it is a traditional Mexican food. Capirotada means bread pudding in English. Capirotadas are usually eaten during the Lent period (comida de cuaresma), or one dish served on Good Friday. There are various kinds of dishes in this event, which generally consist of grilled bolillo (like French baguette) which is soaked in syrup made from whole cane sugar (known as piloncillo), cloves, and cinnamon sticks. Some other special ingredients include nuts, seeds, and dried (sometimes fresh) fruits, including: apples, dates, raisins, apricots, peanuts, pecans, almonds, pine nuts and walnuts . In addition, bolillo also requires aged cheese as a complement, which makes some other recipes replace it with milk. From many recipes of capirotada, all of them do not use any meat. But some other recipes use meat only as a layer. The ingredients for cooking capirotada are mostly the same as those used during the 1640s to make bread and cakes. The ingredients and recipes for making capirotada have been recorded by the Office of the Holy Inquisition, then stored in the archive until now. Where Did the Name Capirotada Come From? We know that capirotada comes from Mexico. But we don't know yet where the name "capirotada" comes from. Similar soups still exist in Spain. Moments after the capirotada reaches Mexico, it develops into sweetness. So the name of the capirotada comes from a friar’s hat. What is Capirotada Made of? Capirotada is a bread pudding originating from Mexico, and made from cinnamon, piloncillo, cloves, raisins, bread and cheese. I make sure you will smell and feel the warm of melted cheese when you cook it. The combination of these ingredients will surely arouse your appetite. The basic ingredients of the capirotada carry rich symbolism to the Passion of Christ, and this dish is considered by many Mexican and Mexican-American families to be a reminder of Christ's suffering on Good Friday. This bread symbolizes the Body of Christ, and the syrup symbolizes his blood, the clove symbolizes the nail of the cross, and all the sticks of cinnamon symbolize the cross. The melting cheese symbolizes Holy. Like all foods in general, capirotada also has a number of calories. But you don't need to worry, there aren't many calories in Mexican bread. Mexican Bread Pudding or Capirotada has 278 calories. So you can eat some without being afraid to get fat. First, cut the bread into small cubes, then put the slice of bread into a large bowl. Second, add two types of milk into the bread slices in the large bowl, then leave for 1 hour in the refrigerator. Third, mix the butter, sugar, egg yolk, vanilla, cinnamon, pecans, and coconut (you can add other fruits) in separate containers such as bowls. Fourth, add a mixture of butter and sugar, into the bread that has been soaked in milk. Fifth, prepare a baking pan, then give the oil up to half full. Then pour the mixture into the baking pan. Sixth, bake the mixture into the oven, then set the temperature to 325 ° F. Then wait for about 1 hour or until the mixture is browned. Last, after the mixture feels cooked (looks browned), take the mixture from the oven, and place it in a container. Capirotada with Condensed Milk is ready to be served. Be sure to eat it right away while it's still warm. Well, that was the recipe for making delicious capirotada with condensed milk. What do you think? It is very easy to make it, isn’t it? Even don't need any special equipment to make it, you can use simple tools in your kitchen. And in addition to the recipe of capirotada that I shared, there are still many variations of capirotada from various parts of the world. Like variations with fruits, vegetables, and other ingredients. For variations of capirotada with fruit, you can make it with bananas, apples, and even coconut. If you want to make capirotada with vegetables, you can use any kind of vegetable that you like as an ingredients. I've even seen some people make capirotada with onions. And for variations of capirotada with other ingredients, you can use cheese. But if you don't like cheese, you can still make capirotada even without cheese. Apart from that variation, there are still variations of other capirotada recipes that are not widely known, for example capirotada with sprinkles, anise, vegan capirotada, new mexico sopa, capirotada with queso fresco, and heb capirotada. Next time if there is a chance, numbones.com will try to make a recipe for another capirotada for you. For a while you can try this recipe first. And don't forget to share your experience after you try to make capirotada with condensed milk from this recipe! 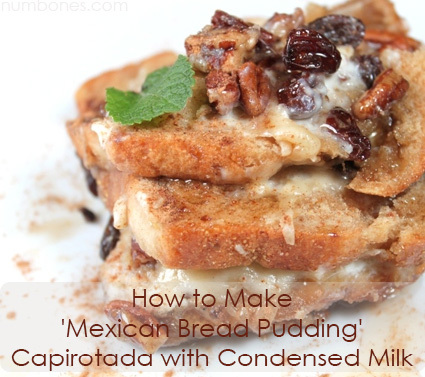 0 Response to "How to Make 'Mexican Bread Pudding' Capirotada with Condensed Milk"